South Korean banks as well as foreign banks are competing against one another through their exchange services as Korean New Year’s Day approaches to secure more foreign tourists. They are competing by expanding their untact transaction systems and exchange services applied with IT. According to industries, commercial banks, foreign banks, and local banks are offering discounts and foreign exchanges and putting out untact exchange services. KB Bank is offering 80% and 50% of special exchange rates to customers who exchange yen and euro or yuan respectively at automatic exchange centers until end of February. In November of last year, KB Bank installed automatic exchange centers at Airport Railroad’s Hongik University Entrance Station. These exchange centers offer automatic services as regular ATMs, foreign ATMs, or multi-foreign exchange (euro, yen, yuan) ATMs. Shinhan Bank along with NaverPay are offering an exchange service through Shinhan Bank’s application called ‘SOL’. Whenever a person exchanges dollar, yen, or euro through NaverPay, Shinhan Bank offers 90% of special exchange rate. For other currencies, it offers up to 40% of exchange rate. To customers who exchange currencies through SOL, it offers a free gift certificate to Wi-Fi Dosirak. It also offers up to 90% and 50% of special exchange rates to those who exchange major currencies such as dollar, yen, or euro or other currencies respectively through SOL. Hana Bank introduced an exchange wallet service through 1Q Bank application with Hana Members. It offers up to $89.38 (100,000 KRW) of reserve coupons from Shilla Internet Duty Free to customers who exchange at least $300 through Smartphone Banking or Hana Members’ exchange wallet. Woori Bank has joined hands with a FinTech company called ‘Bellsoft’. Its customers can now receive foreign currencies that they asked for through internet and mobile banking at its management stores such as Incheon International Airport as well as Bellsoft’s self exchange machines located at Gimpo Airport, Namsan Tower, and major hotels and shopping malls. Foreign banks and local banks are just as busy to secure more customers through their exchange services. CITIBANK Korea launched ‘Multi-Foreign Currency Deposit Mobile Service’ that allows customers to select up to 6 currencies from CITI Mobile application at the same time. One can exchange up to 11 currencies such as dollar, yen, Canadian dollar, Australian dollar, euro, pound, Swiss franc, New Zealand dollar, Hong Kong dollar, Singapore dollar, and yuan. Standard Chartered (SC) Bank Korea is going to offer a special annual interest rate of 2.8% until the 29th of March to those who deposit dollar for the first time at a fixed period of 12 months. Those who are interested must open a regular dollar account and a fixed deposit account at the same time and register a regular dollar account as a withdrawal account for internet banking. 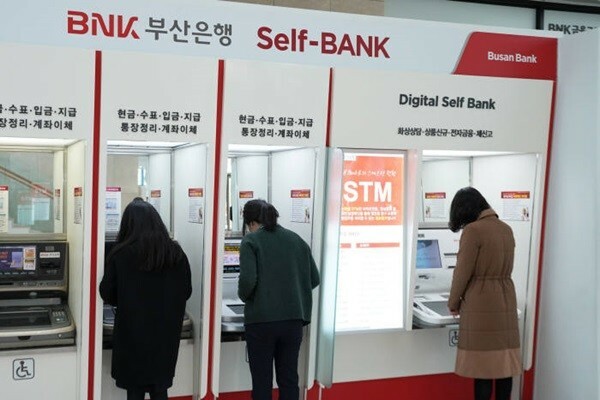 BNK Busan Bank’s customers can use exchange services through a mobile application called ‘SUM Bank’ and ‘Self Teller Machine’. It offers 90% and 30% of special exchange rates to those who use its exchange service for dollar, yen, and euro or other currencies respectively by end of this year.